The forest resources are dwindling fast due to the rapid rate of industrialization and urbanization. The central government wants the future generation to take matters in their own hands and thus, the implementation of the School Nursery Yojana. This scheme will assist the young school students in getting in touch with nature and raise saplings in the nursery of the school. 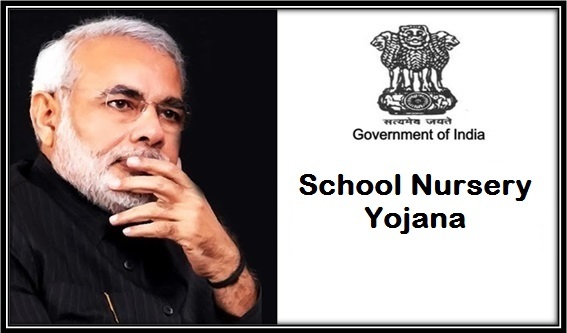 Tenure of the scheme – The School Nursery Yojana has been implemented by the central government for a period of 5 years only. During these five years, the scheme will be implemented and the authority will keep track of the popularity and viability of the scheme. Pilot basis implementation – For now, the implementation of the scheme will be done by the ministry on a pilot basis. If the scheme succeeds in producing positive results in a specific time span, then decisions will be taken accordingly. School students will participate – The main objective of the scheme is to educate the school students, studying in classes 6, 7, 8, and 9, about the importance of saving nature and planting trees. It will also make them aware about the environmental aspects. Raising 1000 saplings – Under the scheme, the participating school will have to encourage the students in planting seeds in the school nursery. All participating schools will have an aim of nurturing the seeds so that they mature into at least 1000 saplings within one academic year. Raising the plants – The school authority must engage the students in sowing seeds in the garden when the academic year starts. Over the months, the students will have to care for the sapling and at the end of the academic year; the sapling will be given to the student so that it can be planted elsewhere. Grant for the schools – Under the scheme, the government will provide a monetary grant of Rs. 25,000 to the first 1000 educational institutes, on the commencing year. This sum must be utilized for the creation of a proper nursery in the school and for its maintenance. If the schools are able to maintain the nursery properly, then the government will provide them with additional grant of Rs. 10,000 for the next two years. Selection of diverse schools – To maintain a balance and to allow more and more schools to participate in the scheme, the government has decided that every year a different school will be picked and provided with the monetary grant. Keeping track of the progress – Each school that has been selected to participate under the scheme will be provided with a format by the government. It will be the responsibility of the school authority to fill the format and keep track of their nursery maintenance task. Submission of the proposal on a state level – It is the responsibility of State CAMPAs to prepare and submit a scheme proposal at the state level. Before the submission of the proposal, it must get the approval of the State CAMPA Steering Committee. Providing funds for the scheme – The state will not have to worry about meeting the financial requirements of the scheme. All funds, needed for the successful development of the program will be given by the NCAC. This money will be directly transferred into the accounts of the State CAMPA. Leading the movement – The government aims at bringing as many schools as possible under the scheme. But at the time, the authority aims at starting with one school per district, in all parts of the country. In future, the school selected first in each district will be dubbed the Lead School. It will then be the task of this school to assist the other institutes. Class related criteria – According to the guidelines of the scheme, all pupils, studying in the standard 6 to standard 9 will be allowed to take part in the program. The students of this age are sensitive and it will be easy to sow the seeds of environmental awareness in the children. Space requirement in the school – Only those schools will be given the permission to take part in the scheme, which have an open area. This area will be used to create the nursery where the students will plant the seeds and raise the saplings. The school must have around 100 sq. meters. Operational Eco Clubs – There are many schools that have Eco Clubs. It has been highlighted in the draft of the scheme that only those schools will be given the preference to join the scheme, which already have an Eco Club, up and running. Maintaining the nursery – The head of the schools will have to provide a written consent to the government department that they will take proper care of the garden for at least a period of 5 consecutive years. Water recycling facilities – It has already been mentioned in the eligibility criteria list that each applying school must have the proper facilities, which can make proper use of rain water. For this, rain water harvesting machines should be implemented. Apart from this, facilities of recycling and reusing waste water must also be present. The schools will have to promise that they will maintain the nursery and plant shrub species, which can be raised in the particular area. They will also have to give the word of raising a minimum of 1000 plants. The papers from the school will then be forwarded by the DFO to the office of the State CAMPA. The respective department will have to check the papers and give their recommendations. If the State CAMPA is satisfied with the papers, they will then forward the documents and their recommendation to the office of the CAMPA steering Committee. They will have the power of making the selections. The educational institute that has been selected will have to create a nursery that can be used as a model for the others. The head of the school must maintain records and keep account of the progress made. This report, accompanied by pertinent photographs of students planting trees and maintaining the saplings must be arranged. When the State CAMPA will have to get the reports and analyze the efforts of the school. The formation of the Online Interactive Web Portal will be done by the CAMPA. On this portal, the report and information, from the school authority, will be published and analyzed. If the educational institutes require any technical assistances or otherwise, during the task of creating and maintaining the nursery, the can get in touch with a set of officials. The list of these officers will be available from the State CAMPA or the DFOs. Once a school has been selected, it will have to provide the pupils, studying in 6th to 9th standard, with the required encouragement to take an active part in the nursery work. The school can treat it as a part of extra-curricular activities or practical assignments to enhance Biology lessons. It is the responsibility of the school authority to arrange small excursions to parks, gardens in nearby areas. These excursions will assist the students in getting close to nature. It will in turn provide the students with knowledge about the ways in which plants react during different seasons and how they change accordingly. The students will also recognize the difference between plant species. It is necessary that the school authority assist and encourage the participating students in creating a logbook. In this log book, they will be able to record their observations and will be able to judge self-progress. Samples of fruits, flowers and seeds can also be recorded in the herbarium. Apart from this, the students must be trained properly by the teachers and nursery workers to collect seeds. They should be told how to dry the seeds and then cut them properly. The students must also be taught to make grafts correctly. The students will also be taught how they can prepare the soil in the pot, where the saplings will be planted. They will be guided to prepare the right mixture of soil, sand and fertilizers so that the seeds can germinate properly. They will also be guided in perfecting the art of filling the plastic bags and pots with the soil-fertilizer mixture. The students will be advised to choose those species, which are native to the particular area. It will assist the students in raising the saplings and maintaining them properly. They will be taught how they can sow seeds, watering and maintaining the health of the saplings. Apart from this, the school authority will also provide encouragement and assistance to the students so that they can organize and take an active part in maintain a record of trees present in the nursery and the nearby areas. It is called tree census. Counting trees is not the only task they will do. Recording observations is also a part of nature study. The school will hand over the sapling to the student when he/she is leaving the school. The three must then be planted at some other place by the student. The school will provide motivation for the students by awarding the performance of the students. The best maintained plant will fetch its caretaker a prize. The task of implementing a scheme as this, all over the country, is not a mean task. The central government will provide the funds required for the success of the program. As the program is on a pilot basis, the NACA will provide a whopping 2.5 crores in the initial years. Once the program proceeds, the budget for the program will be decided accordingly. One of the NGO had implemented School Nursery Yojana in Aurangabad Maharashtra formally. School students, studying in 6th to 9th standard will have to plant saplings in the area. The NGO has started out with the target of planting 13 crore plants by the end of 2018. Every candidate will be given 10 saplings. These trees will be planted within a radius of 1000 sq.feet of the school. best .one child one plant ..
Balak ka Admission karwana hai kaise hoga?